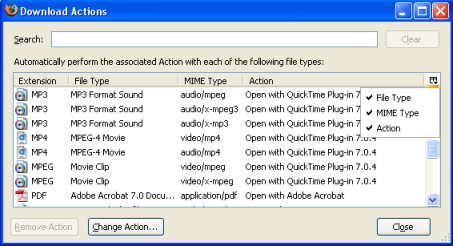 - Starting in Firefox 21 on Windows 7 and above (Firefox 22 on Windows Vista), MP3 and M4A audio files, as well as MP4 video files with the H.264 video codec and either AAC audio or MP3 audio codec, are automatically opened in the built-in player by default using Windows [http://en.wikipedia.org/wiki/Media_Foundation Media Foundation] (see [https://bugzilla.mozilla.org/show_bug.cgi?id=799315 bug 799315] for the background). 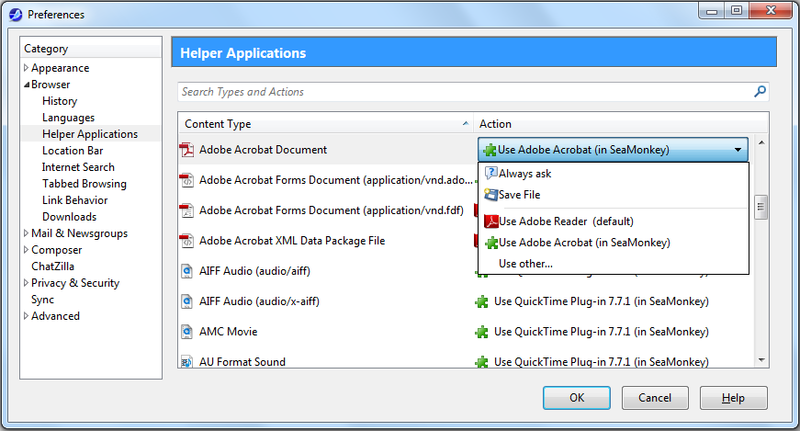 Firefox "Options -> Applications" settings for those content types are ignored, unless you toggle the preference '''media.windows-media-foundation.enabled''' to '''false''' in [[about:config]]; however, doing so will also disable playback of supported MP3/M4A/MP4 <audio> and <video> content embedded in HTML5 webpages. [https://support.mozilla.org/questions/959992] [https://support.mozilla.org/forums/contributors/709209?last=52569&page=2#post-52569] [http://forums.mozillazine.org/viewtopic.php?f=38&t=2711963] [https://bugzilla.mozilla.org/show_bug.cgi?id=837859] [https://bugzilla.mozilla.org/show_bug.cgi?id=825153] + Starting in Firefox 21 on Windows 7 and above (Firefox 22 on Windows Vista), MP3 and M4A audio files, as well as MP4 video files with the H.264 video codec and either AAC audio or MP3 audio codec, are automatically opened in the built-in player by default using Windows [http://en.wikipedia.org/wiki/Media_Foundation Media Foundation] (see [https://bugzilla.mozilla.org/show_bug.cgi?id=799315 bug 799315] for the background). 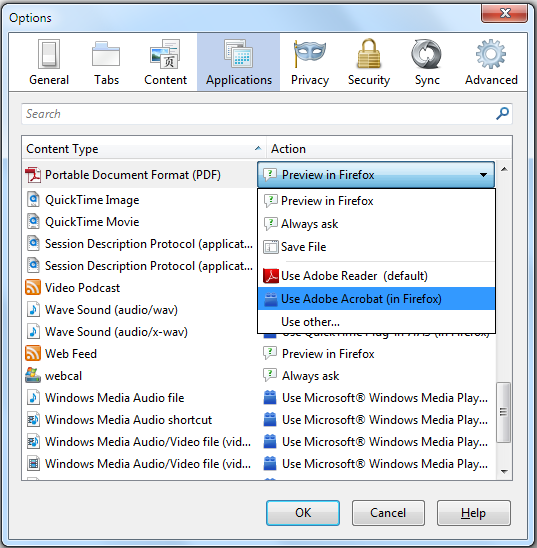 Firefox "Options -> Applications" settings for those content types are ignored, unless you toggle the preference '''media.windows-media-foundation.enabled''' to '''false''' in [[about:config]]; however, doing so will also disable playback of supported MP3/M4A/MP4 <audio> and <video> content embedded in HTML5 webpages. 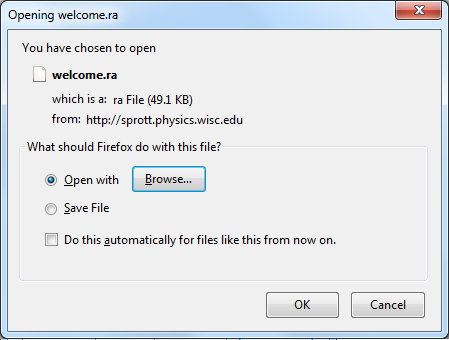 [https://support.mozilla.org/questions/959992] [https://support.mozilla.org/forums/contributors/709209?last=52569&page=2#post-52569] [http://forums.mozillazine.org/viewtopic.php?f=38&t=2711963] [https://bugzilla.mozilla.org/show_bug.cgi?id=837859] [https://bugzilla.mozilla.org/show_bug.cgi?id=825153] Windows Media Foundation isn't available on Windows XP. 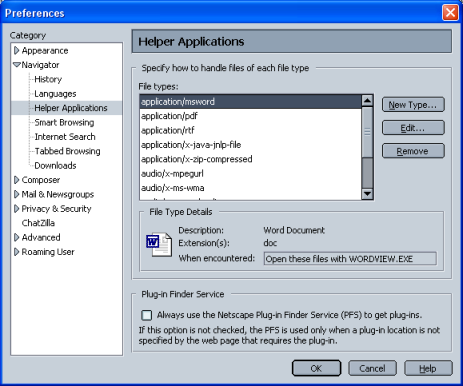 Starting in Firefox 26, MP3 content on Windows XP will open in the browser with the built-in player using [http://en.wikipedia.org/wiki/DirectShow DirectShow]. 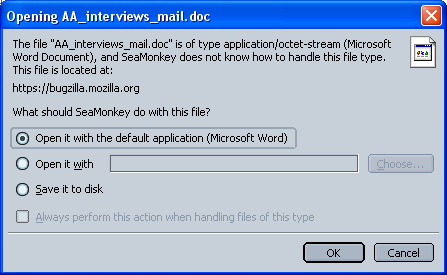 The related preference is '''media.directshow.enabled''' ([https://bugzilla.mozilla.org/show_bug.cgi?id=861693 bug 861693]). Note: Windows Media components may be missing on N and KN editions of Windows (sold to the European market) but you may be able to download a Media Feature Pack from Microsoft to install it. See [https://support.mozilla.org/forums/knowledge-base-articles/710492 this discussion thread], [https://support.mozilla.org/questions/1011225 this support thread] and [http://blog.bitcollectors.com/adam/2013/03/windows-vista-and-7-n-k-kn-special-editions/ this blog post] for details. Note: Windows Media components may be missing on N and KN editions of Windows (sold to the European market) but you may be able to download a Media Feature Pack from Microsoft to install it. 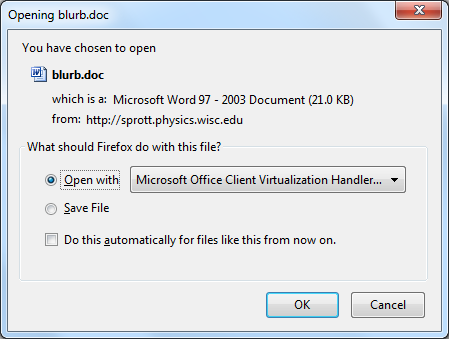 See [https://support.mozilla.org/forums/knowledge-base-articles/710492 this discussion thread], [https://support.mozilla.org/questions/1011225 this support thread] and [http://blog.bitcollectors.com/adam/2013/03/windows-vista-and-7-n-k-kn-special-editions/ this blog post] for details. 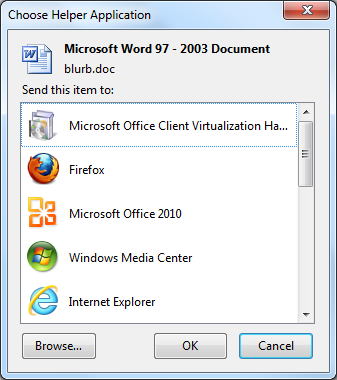 Starting in Firefox 21 on Windows 7 and above (Firefox 22 on Windows Vista), MP3 and M4A audio files, as well as MP4 video files with the H.264 video codec and either AAC audio or MP3 audio codec, are automatically opened in the built-in player by default using Windows Media Foundation (see bug 799315 for the background). 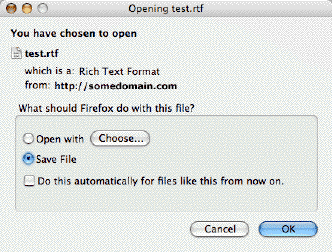 Firefox "Options -> Applications" settings for those content types are ignored, unless you toggle the preference media.windows-media-foundation.enabled to false in about:config; however, doing so will also disable playback of supported MP3/M4A/MP4 <audio> and <video> content embedded in HTML5 webpages. 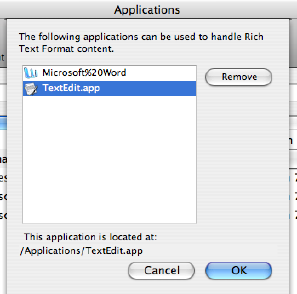 Windows Media Foundation isn't available on Windows XP. 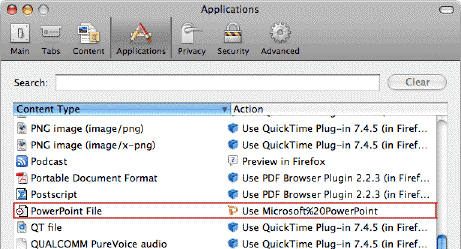 Starting in Firefox 26, MP3 content on Windows XP will open in the browser with the built-in player using DirectShow. 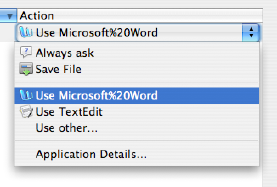 The related preference is media.directshow.enabled (bug 861693). Note: Windows Media components may be missing on N and KN editions of Windows (sold to the European market) but you may be able to download a Media Feature Pack from Microsoft to install it. See this discussion thread, this support thread and this blog post for details.